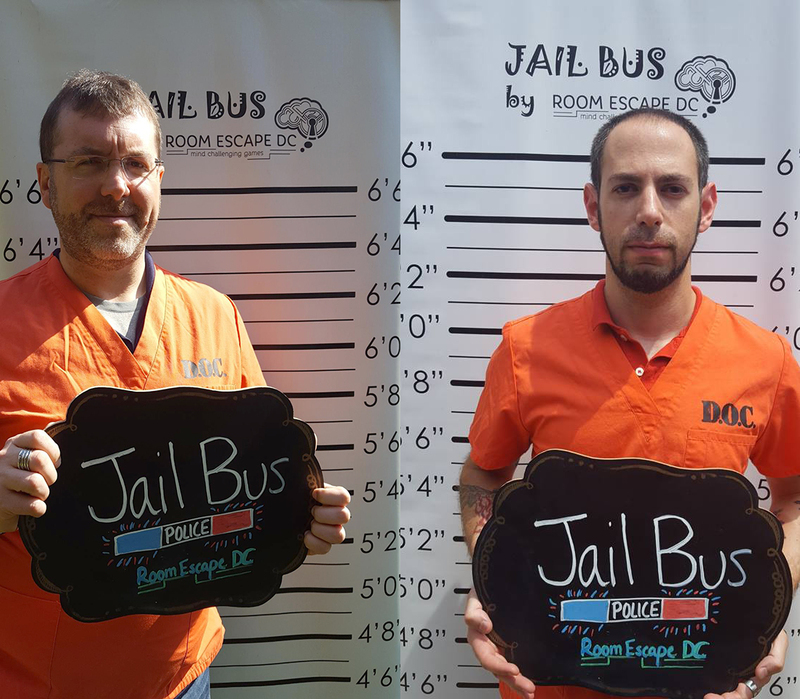 April 25, 2018 January 14, 2019 ~ Mike K.
Having, at the time, done all the rooms at Room Escape DC, and having also at one time tried to schedule the bus for my condo (and failed), there was only one thing left to do: Bill it as a team-building experience and pitch it to my bosses. 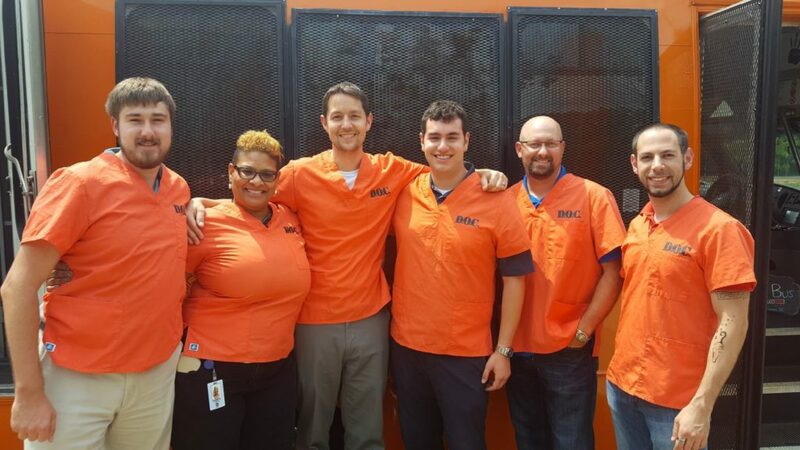 Wasn’t sure what was going to go on (other than wearing orange jump suits and possibly being handcuffed). Sounds like a typical lunch break, right? We had done all of the rooms at Room Escape DC, and we learned about this one too. The problem was the logistics of having it come to your location. Jason tried to set it up as an event for our condo building, but that fell short of the number of people to make it cost-effective. So, wah-wah. You’re being transported to a maximum security prison to serve out a life sentence. On the way, the guard/driver comes down with food poisoning and passes out. You have as long as you have (40 minutes) to get off the bus and escape to freedom, else be hauled back off to jail. Rating: 7/10 So, something happed and you got yourself convicted of some pretty nasty crime and were given a tough sentence… life in prison at one of the worst prisons in the country. While on your way to your lovely accommodations, your prison guard (who is driving the bus) comes down with a serious case of food poisoning and passes out. Rating: 6/10 You have 40 minutes before the police realize that the guard didn’t check in and dispatch someone to make sure you stay in prison. I – for sure – really don’t want to spend the rest of my life worrying about which gang to join, or what is going to happen to me every time I go to get a meal… or take a shower *shudders* so in that scant 40 minutes, my fellow team of inmates and I have to figure out how to get out of these damn handcuffs and escape the locked bus. Considering the severely limited amount of space to work in, there were a good number of puzzles to be solved. There’s a smattering of them (meaning they were all different types, thankfully), but there were also a solid number of straight pad locks (and, honestly, that’s to be expected in this scenario). There was at least one puzzle that everyone took a shot at (that’s actually a ‘pun intended’ line, but you won’t know that until you play through…) that was tougher than we thought it would be as well as some logic to be used. It was a surprising puzzling experience. Rating: 7/10 I was really surprised at how many puzzles they fit into this shuttle, and how each of them were designed to operate. I gave some initial instructions to my team, and we figured out a way to get out of the handcuffs pretty quickly and then began searching for clues and hints. While I had quite a bit of experience in Escape Rooms at this point, I decided to sit back and observe a bit more and let them start working on the “room” and the puzzles themselves. Once I saw they were going in the right direction, I moved on to the next smaller team and offered a nudge here or there. There was one puzzle, however, that I did have to try out and that was because I wanted to see how it operated. Some of them were wondering why we found certain props in the room, and when we started to use them to solve the puzzles, they started to get a bit more excited. The other puzzle I stepped in on was one I had seen before, and Tara and I kinda took over that one because the rest of the team was confused as to what we were doing. There were a number of combination and key locks, but I’m okay with that given the nature of the theme and mission. Other than the technical difficulty we had with one item, nothing was overly complex. We made a few stupid mistakes, but quickly got our rhythm back and got ourselves back under control. We did get stuck for a minute or 3 on one of the puzzles, but I blame myself for not stepping in sooner and looking at it. Rating: 7/10 I don’t think any of the puzzles were overly complex, but it could be because I’d seen some similar types in other rooms so I had an inkling as to how to go about solving them. That being said, my team did really, really well and solved a bunch without any nudges from me or our GM Spencer, so their rating as being their easiest experience is pretty spot on. There was a point where I think they started getting anxious as to the time and wanted to get a clue (we were offered 3), so we took it after being stuck for about 4 minutes. I think if we had searched and thought about it for another minute, we would have gotten it. I also think they wanted to put up a really good time (we were the first to go in the morning) so the rest of the groups had some competition going. There were a few puzzles that flowed directly together, so it was good to see that in such a setting. Everything basically related back to some facet of the inmates or the jail itself. You also have the option of being handcuffed (either both on you or cuffed to another inmate), so I chose to be cuffed on my own (well, no one else wanted to be cuffed and I’m what you call an Expert). It actually did make trying to do certain things in the bus physically harder, though. Rating: 9/10 Being handcuffed in the room isn’t a unique premise, but it really did add to the experience and we recommended that all future teams try it. 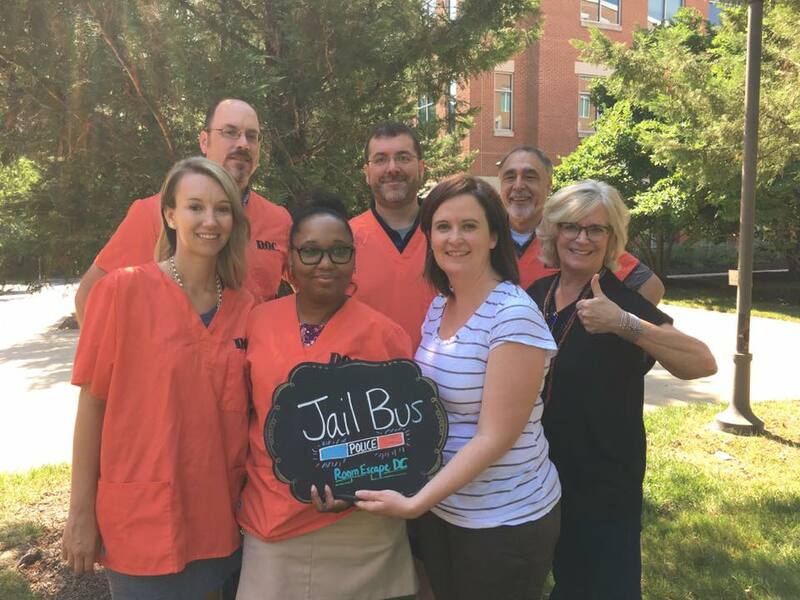 Our CEO and some of the other executives stepped on the bus when we were about to start to get an idea of what they were paying for, and they had a good time just observing us standing there in prison garb and handcuffed. The experience starts off a bit slow until you find your way out of the cuffs, but that is where really good communication skills come in. If you get your team in sync, then you’ll move pretty quickly into searching the bus for clues and puzzles and locks to solve. Everything in the shuttle was something that you’d expect on a prison bus… not even just a prison, so that was well designed. We were able to work in small teams only at the very beginning, and then it went kind of linear from there, but when you’re operating in a small space, there is one so many places to hide the puzzles and locks. I was the only one in my group that decided to wear the handcuffs. I would not recommend it. It actually did make some of the things I was doing harder (but I guess that was sort of the point). Other than that, it was pretty fun. And pretty sure there was no key to be found when I went through… Definitely had a great time in this room. They give you the option to be handcuffed to start the room, and I convinced my entire team that we should go for the full experience. Everyone was handcuffed to a partner, and I (being the odd person out) opted to have both of my hands cuffed together. That DEFINITELY made the room much more challenging until we found the key. However, everyone had a great time and said that they’d do another room, so I count that as a double win. Spencer was pretty hands off, but as he’s sitting in the drivers seat, he was right there and helped us out if we needed it. Spencer was our GM. He did a really great job describing the escape room concept to my team of Escape Room Virgins, and really amped up the story to get them excited about the room. I don’t remember if we asked for a clue or just a clarification on something. We asked for one clue, and he gave us just enough so we knew how to proceed without getting the entire solution. Good to go here. Nothing to report. Rating: 0/5 Nope. Didn’t feel stupid on this one. Final Thought: Even though we both had different teams with different experience and skill sets, and different ways we approached the mission, we both got our teams out and they all said that they had a good time. At Mike’s company, over 50 people went through the bus that day, including people who were claustrophobic, or who had never done a room before. Jason’s final head count was 18. All had a great time and that… in the end… is really what counts.